Oats. Quinoa. Millet. Amaranth. Buckwheat. Simple, right? This unique blend of super grains packs each KIND Healthy Grains bar with more than 1 full serving of whole grains, which provides fiber and protein. So grab the delicious snack that will help support the balanced diet you work hard for. Like all good things in life, we believe two is better than one. That's why our Dark Chocolate Chunk bar has twice the chocolate, made from whole grains coated with dark chocolate and real dark chocolate chunks. This perfectly chewy-with-a-crunch snack is both healthy and tasty. From the healthy snacks and foods we make, to the way we work, live and give back, we're focused on making the world a little kinder. Welcome to the KIND community! At KIND, we do things different and try to avoid false compromises. Instead of "or" we say "and." We choose healthy and tasty, convenient and wholesome, economically sustainable shines through in everything we do and how we do it. We worked tirelessly to reach this perfect texture, a unique combination of chewy and crunchy, so you never have to choose between the two. We make simple, all natural products and deliver healthy snacks made only from ingredients you can see & pronounce. Each artisanal blend of whole grain clusters is gluten free, a good source of fiber, and can be enjoyed as a snack, over yogurt, or with milk! 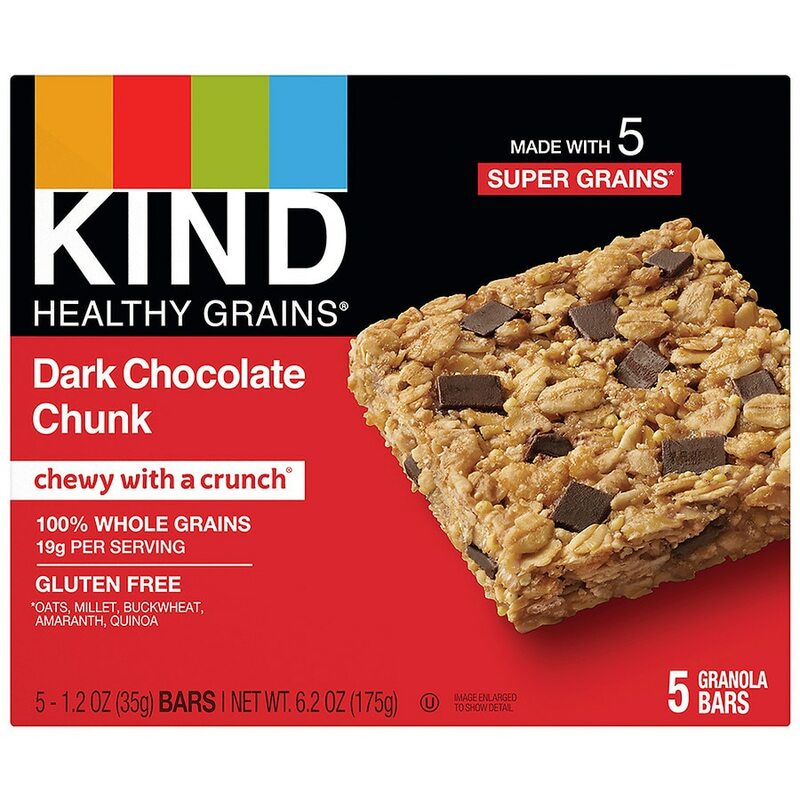 We'd love to hear what you think about KIND Healthy Grains bars! Contains coconut and soy. May contain dairy.